I recently travelled to the US for a closer look at global health care companies. The trip was timely - the investment decision in the sector became increasingly contentious during 2016, driven by the US political debate as well as some weakening fundamental trends in the stocks. I came away with a confirmation of the relatively weaker earnings trends for the sector and a high level of uncertainty around US health care policy. There does however appear to be evidence of emerging value. After gradually decreasing our portfolio risk to health care stocks in 2016, we are now closely watching for clarity on government policy and confirmation of a ‘normal’ turning of the expectations cycle. 1. There is genuine uncertainty around what the new US administration will do to the health care sector. a) Reimbursement reform: There is no doubt the US health care sector has a cost issue, with costs constituting almost 18% of national GDP, almost twice as high as many other developed nations. However it appears too simplistic to just discuss a drug pricing issue – it’s a health care pricing problem. Drug costs make up just 17% of total health care costs, indicating the issue is spread across the entire industry chain. New statistics from the government (see chart below) demonstrate this issue. In 2016, total prescription drug costs in the overall system grew 5%, in line with other health care costs. 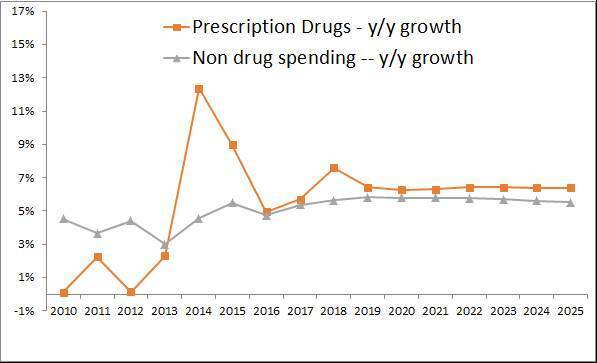 Also, what distorts peoples’ view is the recent cost spike in the system primarily from Sovaldi. The innovative Hepatitis C drug from Gilead was launched in 2014 at a cost of over $80,000 for a 12-week treatment (but Sovaldi does permanently cure up to 90% of patients, leading to long term savings). The 2014-15 time period also distorted Wall Street’s future expectations and models, leading to inflated earnings forecasts and valuation multiples. It was clear during my trip that the large pharma companies are turning more proactive in the debate on drug pricing. For example, J&J stated its 2017 earnings guidance includes just one price hike, and it will be in the single digit range across the portfolio. Other companies are now offering similar guidance, so overall we’re seeing some increasing adjustment to the new environment. b) The Affordable Care Act (Obamacare/ACA) has been a pet hate for Republicans. It is a key focus and election promise to revoke or repeal it. The problem is ACA has lifted almost 20 million new people (voters) into having health insurance, so simply dismantling it appears a bit contentious. We would definitely expect changes to ACA, but there are already signs of divisions within the GOP on how to approach it. ACA has been a growth driver for parts of the health care industry, amongst them hospital operators. Management of hospital industry leader HCA holds the view that Republicans will avoid leaving people completely uncovered by health insurance again, and that making any significant changes to the system could take years. c) Tax reform. The border adjustment tax discussed by Republicans would likely have a relatively limited impact on health care compared to some other sectors. However, the pools of cash stranded overseas are large across the sector, so allowing tax-efficient repatriation of it could be quite positive. 2. Evidence of weaker earnings growth for the global health care sector. The recent reporting season again saw a majority of companies hitting expectations, but outlook statements led to small earnings downgrades at almost half the companies. The underlying earnings growth drivers have weakened and management teams are under more external pressure. This stems from the tougher environment for drug price hikes, both due to the bargaining power of large health insurers and pharma distributors, as well the increased focus on price gouging. J&J put it well during the trip: “One thing is clear – you can’t increase prices without real drug innovation anymore”. A reasonable indication would be that the industry recently enjoyed 4-6% annual net price hikes, but can now expect 2-3%. In 2016, it was 2.5% according to government statistics. Earnings revisions in an absolute sense for health care companies don’t look so terrible (we have seen some minor downgrades) – but other sectors have seen a strong upswing, so from a relative point of view the fall is noticeable. Simply put, there has been a change of earnings leadership in the market, and health care has been at the losing end of it. 3. Some pharmaceutical companies are seeing genuine earnings pressure. Diabetes has turned into a problematic area after many strong years. A wide range of new drugs are launching, weakening pricing power. Novo Nordisk recently issued another profit downgrade and tallying up management’s message with consensus earnings forecasts, we still see risk to the downside from pricing pressure. This former market darling currently trades at P/E multiple of 15x, down from 30x in 2015. Another high profile victim of new trends is Gilead (mentioned above) whose Hepatitis C franchise previously drove a superb earnings upgrade cycle and share price momentum. In 2016 a perfect storm arrived with both volume and pricing pressure, as well as emerging new competition from Merck and AbbVie. Earnings revisions took a sharp turn south and Gilead just issued a profit warning for 2017. 4. Emerging pockets of value. 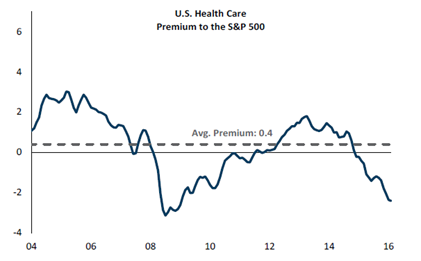 Earnings expectations for health care have been re-setting at a lower growth trajectory, but there is emerging value in the sector. The sector previously traded at premium multiples to the market, but these have evaporated (see chart below). On simple P/E multiples, currently the US large cap biotech sector is trading at 12.8x 2017 earnings, and pharma at 15.9x. The overall market sits at 17.7x forward earnings. The multiples imply the market is ascribing a decreasing value to R&D and drug pipelines, as indicated by stock weakness of companies with highly innovative track records, such as Celgene and Biogen. The industry’s drug pipeline (by number) has continued to grow and is larger than five years ago. A strong commercial pipeline success is the crucial factor for sustained sector ROIC. Will they be successful? There seems to be a general view in the market that 2016 was a tough year for clinical trial results, with an unusually large number of failures. However, this myth was recently de-bunked by analysts at Citi: out of 126 phase III results across the industry, 67% were successful. Amongst large cap pharma the hit ratio was even more positive at 83%. Any firm, actual policy changes to drug reimbursement and pricing…or a clear confirmation there will be no major changes. The real content of ‘Trumpcare’ and the realistic timeline for its implementation to replace ‘Obamacare’. Confirmation of a ’normal’ turning of the expectations cycle. Earnings expectations will eventually, as they always do, end up overshooting on the downside. Typically, this is also coupled with some attractive valuation multiples, and the combination of the two will be a powerful setup for a return to stock outperformance. This sector has plenty of companies with sustainable, competitive market positions, generating strong cash flows and returns on capital, with relatively low cyclicality. Quality franchises in the sector will without doubt at some point return to the leadership of the market. Until we get more clarity on any of these factors, we’re likely to remain on the cautious side of the sector. Naturally, in this environment, we also prefer to invest in companies mainly driven by volume growth, not price. 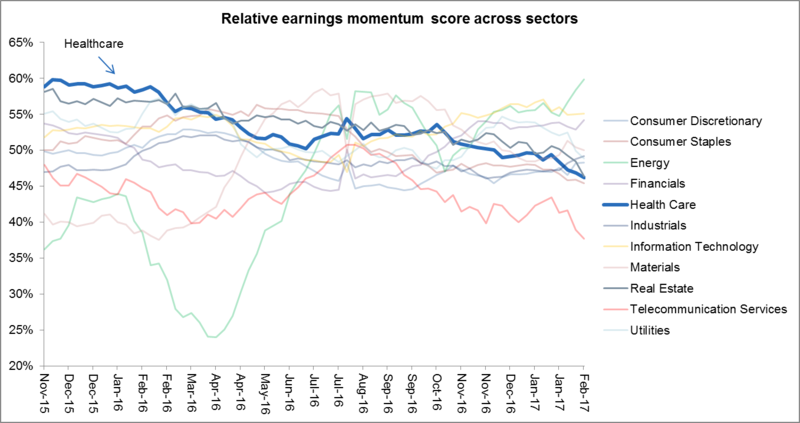 Valuations are approaching the attractive zone, but the range of earnings outcomes is still quite wide and too driven by political/binary factors, for us to take a higher conviction portfolio position at this point.